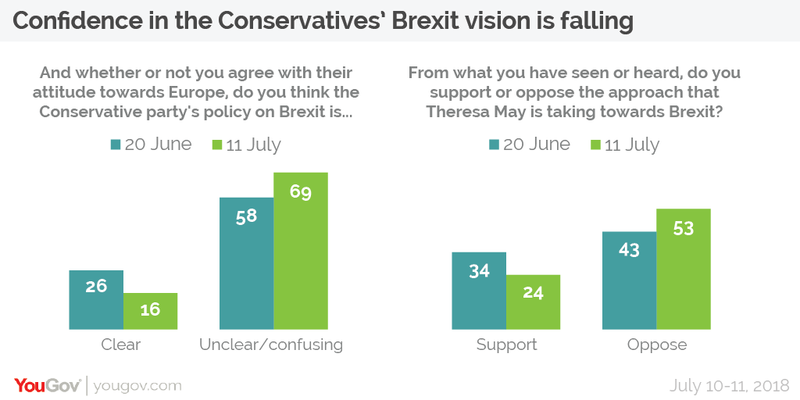 July 12, 2018, 11:55 a.m.
With the resignations of David Davis and Boris Johnson rocking the government following disagreements over the Brexit deal outlined at Chequers over the weekend, new YouGov polling reveals the impact the events have had in diminishing support for the Conservative party and the Prime Minister. Likewise, support for Theresa May’s approach to Brexit has fallen over the same time period from a third (34%) to a quarter (24%), while opposition has risen from 43% to 53%. 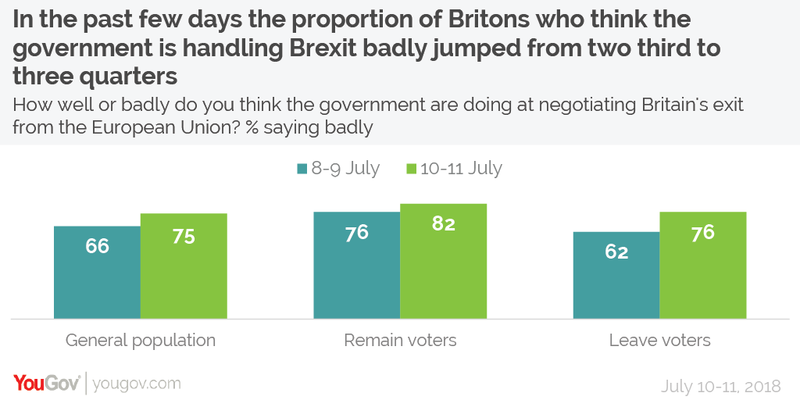 In just a few days the proportion of Britons who think the government is doing a bad job at negotiating Brexit has risen from two thirds (66%) to three quarters (75%). Only 13% believe the government is doing well, down from 18% on Sunday. 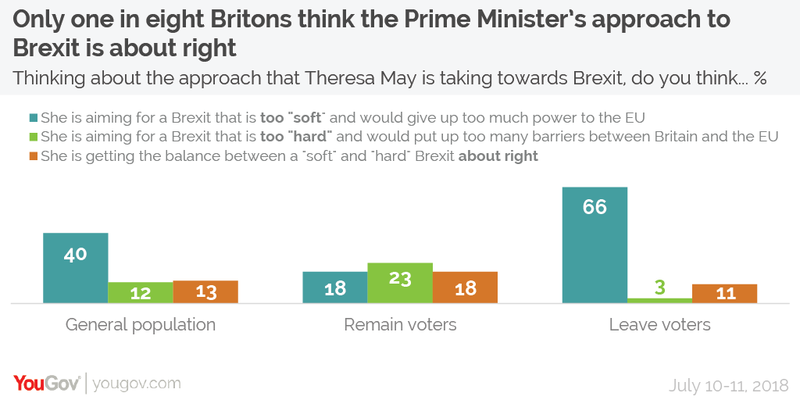 Four in ten Britons (40%) believe the Chequers Brexit deal is too “soft” and would give up too much power to the European Union, including two thirds of Leave (66%) and Conservative (64%) voters . Only 13% of Britons believe the deal gets the balance about right (11% of Leave voters, 19% of Conservative voters). 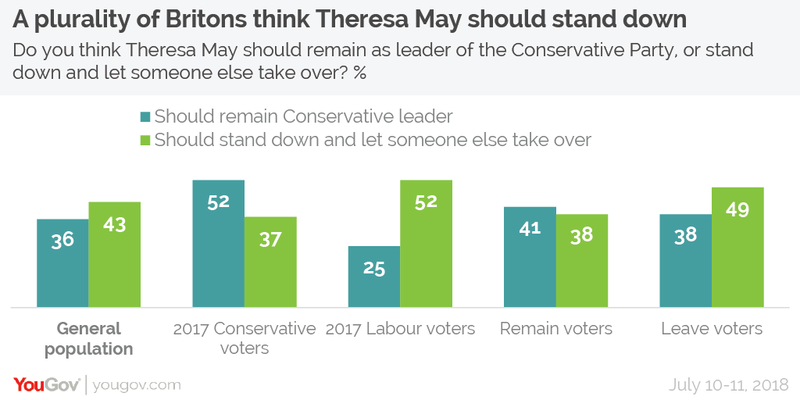 More than four in ten (43%) believe that May should stand down as party leader compared to 36% who think she should stay. This is a rough inversion of the situation in November last year, when 42% believed she should stay on and 32% said she should stand down. While a majority of 2017 Conservative voters still want the PM to remain in place, this figure has fallen from 77% to 52% over the time period. And whereas before Leave voters were more than twice as likely to want May to stay before (56% vs 25%), now they would support her departure by 49% to 38%. 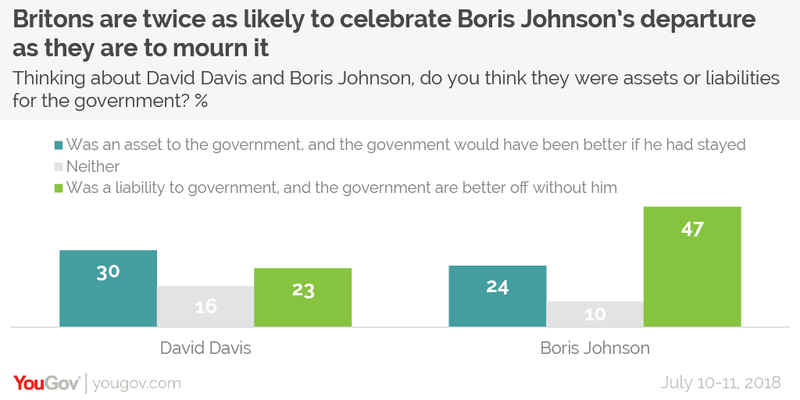 Almost half of Britons (47%) believe Boris was a liability, and that the government is better off without him, while only 24% believe he was an asset to the government whose absence will be detrimental. Conservative voters are split 42% asset/36% liability, while Leave voters come down slightly more on the side of him being an asset, at 41% vs 32%. David Davis is more likely to be missed, with 53% of Conservative voters having considered him an asset and only 13% a liability. A similar proportion of Leave voters feel the same way – 50% vs 13%.